I breathed a sigh of relief when these macaroons came out of the oven golden brown, with crunchy exteriors and soft interiors. And I breathed a second sigh of relief when my dipped chocolate looked… well… normal. Not drop-dead-candy-shop gorgeous, but passable. Normal, even for a home kitchen. 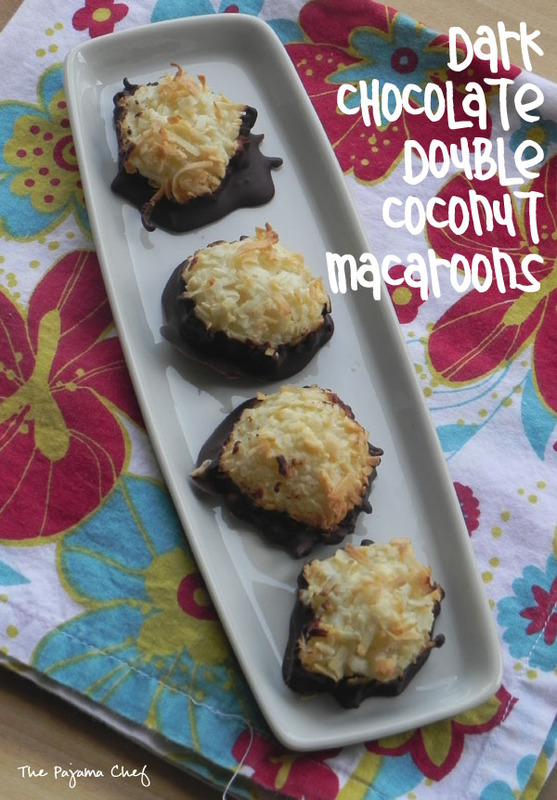 And then I wanted to run away to the beach with the entire tin of Dark Chocolate Double Coconut Macaroons. They were so good [c’mon, I had to allow myself one to taste test. That’s just a thing ya do!] and I wanted more. But guys… I decided to share. 🙂 It was just the right thing to do. Preheat oven to 325 degrees. Line 2 large cookie sheets with parchment paper. Set aside. Combine 14 ounces coconut and the powdered sugar in a food processor. Pulse until chopped into small pieces. Add cream of coconut, cream cheese, flour, egg whites, vanilla and salt. Pulse until mixed well. This batter will be soft, wet, and gooey so refrigerate for 15-30 minutes to make it easier to work with. Place some of the remaining coconut flakes in a shallow bowl or baking dish [you can put it all in but you may not use it all, so I used a bowl and added more as necessary]. Drop rounded tablespoons of chilled batter into the coconut flakes, toss some coconut on top, and then gently roll with your hands to form balls. I found that some of the softer balls required more coconut to hold them together. Repeat until all batter is used. Place 1 inch apart on prepared pans. Bake for 25-30 minutes, rotating pans from bottom to top and front to back halfway through. Be sure to check early and often so they don’t burn! Let cool on baking pans for about 5 minutes and then transfer to cooling racks to cool completely. I cooled mine overnight and just covered up the cooling racks with a kitchen towel. Line a baking sheet with parchment paper [just reuse what you already have, and discard excess coconut flakes]. Combine chocolate and coconut oil in a small bowl and melt in microwave until smooth. I always melt chocolate at 50% power with 30 second bursts, stirring in between. Dip bottoms of macaroons in melted chocolate, then place chocolate-side down on prepared pan. Refrigerate 30 minutes or until set. Store macaroons covered in the refrigerator until ready to serve. Time: 60 minutes active, plus time to chill. They look melt in your mouth good!!! oh, they are so delicious! thanks! 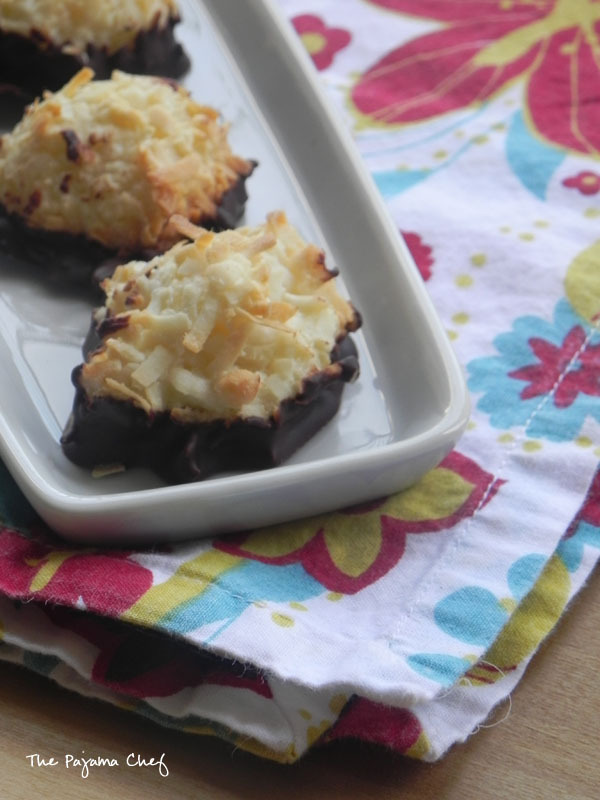 Love that you dipped the macaroons in dark chocolate! These will be a hit at any party! 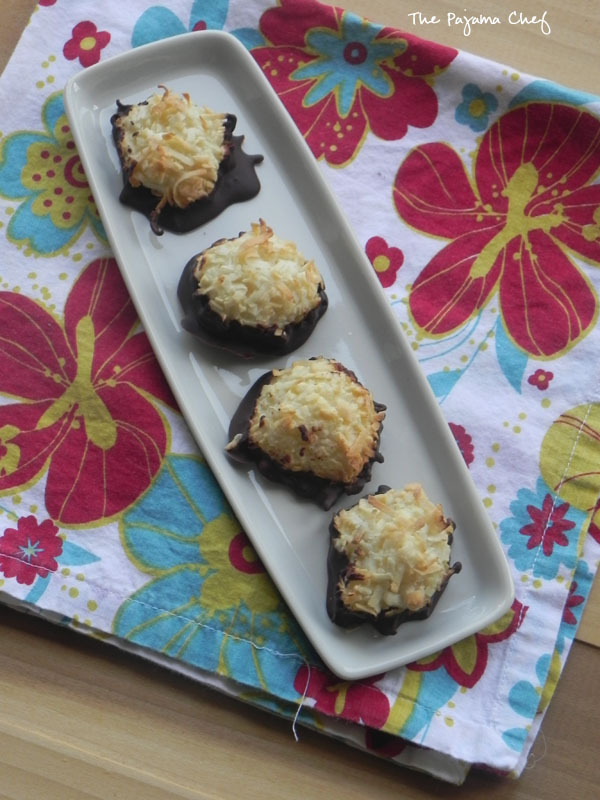 Chocolate and coconut is always a great combo. I had this recipe , originally I found it in Gourmet or Bon Apetite Christmas cookie magazine, pre 2000. Didn’t have the coconut oil ingredient. Everyone loves them, dozens eaten in minutes by just a handful of people! If you love Mounds candy bars, you’ll love these cookies more. I like to use melted raspberry chocolate chips too in place if semisweet. Stick an almond sliver on top too! good catch! looks like the original source was bon appetite (on the linked blog’s post). i like the idea of raspberry chips too. 🙂 thanks for commenting!